Although the weather is starting to cool down, that doesn’t mean you have to put an end to your gardening efforts for the year. In fact, fall is one season in particular where some gardens look their best! But, since outdoor conditions are different during this time of year, it’s important that you’re planting the right types of flowers if you want your garden to pop. Below, take a look at some of the flowers we recommend as you work on your garden this season. 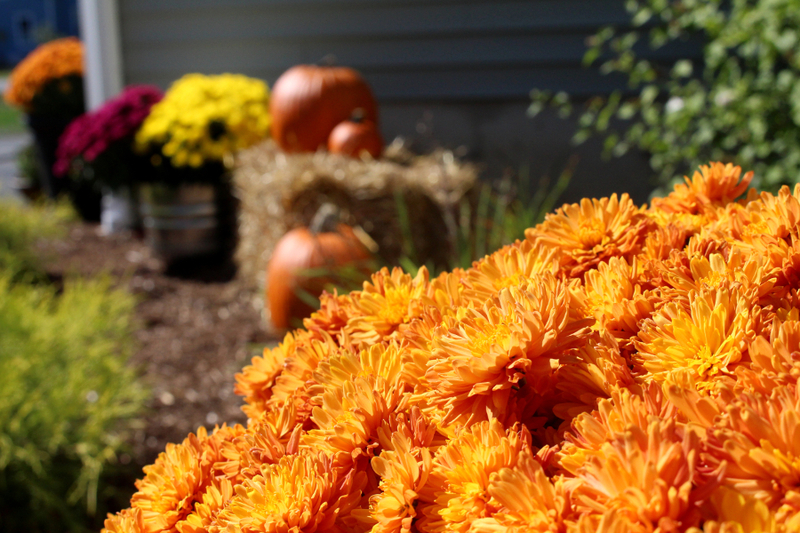 Mums are some of the most popular flowers for fall, and for good reason – most notably, their vibrant colors offer an beautiful aesthetic appeal. If you aren’t planning to keep your mums in a pot this year, make an effort to get them in the ground as soon as you purchase them for the best results! Pansies are ideal for this time of year due to their ability to withstand cooler weather. Unlike some flower types that don’t get along with low temperatures too well, certain varieties of pansies are even said to be able to survive snow! If sunflowers are one of your favorite flower types, consider helianthus flowers in fall – they’re often referred to as the perennial sunflower! Helianthus flowers are daisy-like and gold in color, and they’re even known to attract butterflies, which can add some more life to your garden. Another one for sunflower fans is heliopsis – these are often called “false sunflowers” due to their extremely similar appearance! These perennials begin blooming in midsummer and will continue to last through the fall. Russian sage. Russian sage can be recognized by its pure purple flowers and green-silver like foliage. These plants do well from midsummer through fall, so if you’re looking to add some color to your garden, now’s the time to start planting! Black-eyed Susans. Black-eyed Susans can be found blooming from late summer all the way until it frosts, which means you’ll get a lot out of them if you add them to your fall garden. A benefit of these is that they don’t require too much deadheading, making maintenance much easier on you. Fall crocus. Many gardeners associate crocuses with spring, but the truth is that there are bulbs that can be planted in the fall too! Autumn crocuses are members of the lily family and produce beautiful blooms – just keep in mind that you want to plant these as early in the fall season as you can. Fall is a sedum plant’s favorite season, and thus the season where they thrive best! These too require little maintenance and produce flowers that stay in good shape even throughout some of winter. Toad lilies. Toad lilies are extremely unique in their appearance (their flowers are speckled), so if you’re looking for something to make your fall garden stand out, they could be your best bet! However, keep in mind that our furry friends outdoors find these attractive too, so you’ll need to be strategic with your planting if your garden tends to get visitors. Chinese lantern. Another fall blooming flower to consider if you’re looking to be unique is the Chinese lantern. The flowers produced in summer are beautiful, but in fall, the lantern-looking blooms they produce are one of a kind. See? There are plenty of flowers out there that can be planted in fall – all you have to do is look for them. And for those of you who prefer to spend most of your time indoors as the weather gets colder, there are plenty of fall flowers you can surround yourself with too!